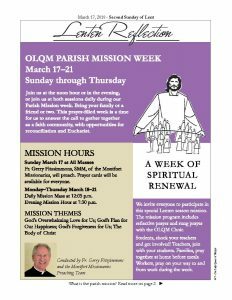 The Mission is a spiritual week of renewal and reflection. It is not an individual’s retreat or a series of talks. It is a communal prayer experience with our whole faith community praying together, to listen more attentively to God’s word and His call to each one of us. Fr. Gerry Fitzsimmons, SMM, of the Montfort Missionaries will guide us in spoken prayer and sung prayer, with the OLQM Choir performing a program incorporated into the mission teachings. Morning Mission Mass at 12:05 p.m.
Evening mission hour at 7:30 p.m.
We hope everyone will participate as fully as you can. Come one day, all days, or twice during one day! Bring a friend or two! 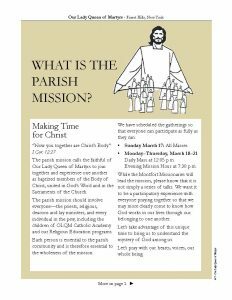 What is the parish mission?